After eight months of information-gathering and study, the Energy Research Council will release its report tomorrow on how the Institute can address global energy challenges. The report marks the culmination of the first phase of President Susan Hockfield’s first major initiative as MIT president. As part of the day-long MIT Energy Forum, the report is scheduled to be presented in Kresge Auditorium at 9:20 a.m. following opening remarks by Hockfield. The Forum, entitled “Taking on the Challenge,” will include three sessions about energy research, as well as a poster presentation sponsored by the MIT Energy Club. The focus of the day is the report itself, which makes recommendations primarily on energy research and education, according to Council Co-chair Ernest J. Moniz. The three panel sessions with MIT professors will follow closely with the main research recommendations made in the report, Moniz said. The panels — Science and Technology for a Clean Energy Future, Improving Today’s Energy Systems, and Energy for a Rapidly Evolving World — will discuss emerging areas of energy science and technology, opportunities to improve existing energy systems, and the relationship between energy and crucial policy issues, respectively. “Society is beginning to recognize that energy research is important,” said William H. Green, professor in chemical engineering and a member of the Council, who will chair the second panel. A question and answer session with Hockfield, along with three faculty members, and the president of the Energy Club, will follow the third panel. The Energy Club will host a poster presentation and energy showcase during lunch in Kresge Lobby as part of the Forum. According to Energy Club President David T. Danielson G, 10 to 12 groups will be in attendance, representing student research, student projects, and recent start-up companies from MIT. The Solar Car team and companies such as Agrivida, an agricultural biotechnology company that began at MIT in 2003, will give presentations. There will also be a fuel cell demonstration from the Electrochemical Energy Laboratory, Danielson said. The Council, consisting of 16 faculty members from all five MIT schools, was created after Hockfield’s inaugural address last May in which she announced that energy research was an MIT priority. The Council was tasked with creating recommendations for the Energy Initiative and will be disbanded following the forum. “This initiative will foster new research in science and technology aimed at increasing the energy supply and bringing scientists, engineers, and social scientists together to envision the best energy policies for the future,” Hockfield said in her inaugural speech last May. In the fall of 2005, the Council solicited input from faculty and students, asking for white papers detailing research directions that should be taken by the Energy Initiative. A campus-wide survey was conducted by the MIT Energy Club, and MIT received input from industry in a December workshop. More recently, the Council helped to set up the EnergyClasses site to highlight graduate and undergraduate classes with a significant focus on energy. The events will be webcast and made available on MIT World (http://mitworld.mit.edu/). 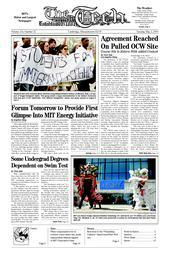 The Forum (http://web.mit.edu/erc/forum/) also kicks off two weeks of energy-related events.